It is nearly Easter! The end of the long term is nearly here and I just wanted to write to you to update you about a couple of things. 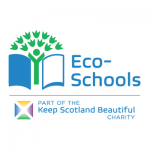 Firstly, I want to you let you know that a team from Perth and Kinross Education and Children’s Service will be visiting the nursery and school on 27-28 March. This visit is called an Extended Learning and Achievement Visit or ELAV. The team will be in classes and around the nursery and school, speaking with pupils, staff and parents. They will be looking at our planning and self-evaluation and challenging and supporting us. After the visit, they will provide a report to help us set priorities for improvement. You will hear more about this in due course. We welcome this visit and we’re looking forward to sharing all the great things that are happening in St John’s RC Academy with the team. The Parent Council recently met and have rescheduled the Fayre and the Quiz night for May. Look out for the details coming to you soon. The Council also asked me to highlight once again our Pupil Opportunity Fund and the information on the Cost of the School Day. We have put these in place to enable parents to plan for the costs of school better and have a way of seeking support when required. We are delighted to say that already there are children who have been able to access opportunities which they wouldn’t have been able to before. As you may know from your children, there has been a focus on respect this term in the primary school. 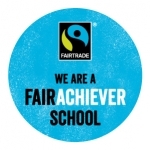 This is one of our four values – fairness, achievement, respect and love. We show this respect in lots of different ways – working hard in class, listening well, being polite and kind to others, wearing the uniform, being on time, taking responsibility for ourselves. 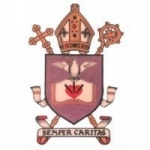 During Lent, we have been fundraising for SCIAF once again. This has included our P3 Café and S6 fasting for 24 hours and camping overnight in the school. All of our fundraisers are showing respect for their brothers and sisters across the world. Thank you too for your generosity. 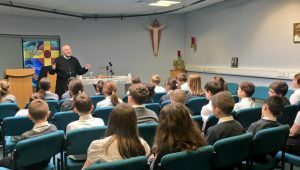 Our pupils have been participating in the St John’s Parish Mission (see picture) both in school and in the church itself. 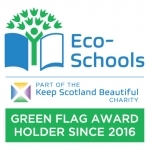 I would also like to commend P7 in particular for demonstrating the value of respect over the last few weeks as they’ve been preparing for their show and keeping up with their classwork. It is great to see the children so engaged in their learning and excited to show off their considerable talents. I’m really looking forward to seeing them perform the Amazing Adventures of SuperStan! Finally – dropping pupils off. Just a reminder not to enter the turning circle to drop children off. There is a drop off point near the all weather pitch. Parents dropping their children off at the same time as the buses are arriving causes gridlock at times. It is also very dangerous with so many children around. Please drop your child off in a safe area and let them walk the short distance to school. Your cooperation is appreciated. I wish you and your family a blessed Easter and I look forward to welcoming all the pupils back on Tuesday, 17 April 2018.